SecurityStockWatch.com: Thank you for joining us today, Dave. There have been many exciting developments at ICOP recently: deals with Homeland Security, a Montana State Contract, and the partnership with Raytheon, among others. Before we drill down into those subjects, we understand that you have been Chairman, President and CEO of various banks and in investment banking with Stephens, Inc. Please tell us about your background. Dave Owen: I have over 50 years' experience in business having owned and operated banks in the Kansas City area and subsequently working for several years at Stephens Inc., Investment Bank headquartered in Little Rock, AR prior to becoming Chairman and CEO of ICOP. The experience in the financial industry has served me well in my current capacity. In addition I served my home state of Kansas as State Senator and Lt. Governor. Dave Owen: The sale to the US Department of Homeland Security was very significant. Nineteen vendors competed for this business and we are extremely proud of this win. Our systems were deployed in 104 Border Security pursuit vehicles. These 104 cars are spread across all 42 points of entry along the US - Mexico Border. This initial order represents only 5% of the total Border Patrol fleet. Border Security is scheduled to procure over 2,000 new vehicles in Federal FY '11 positioning us for significant growth from this account as we move forward. SecurityStockWatch.com: Congratulations also on various contracts at the State Government level. So far this year, we have read with great interest about your success stories in Montana, Florida, Alabama, Newark, Minnesota, and Texas. Care to elaborate? Dave Owen: The success we are having is in direct relationship to the quality and durability of our equipment and the relationships we have worked hard to develop with key accounts and strategic targets. For example, ICOP has a very strong position in the State of Montana. Twenty-two percent of the law enforcement departments in Montana are already outfitted with ICOP equipment, and this contract will help to expand our presence there. We always keep in mind that we are recording evidence that impacts people's lives and our products are designed accordingly. Law enforcement officials and other security related organizations across the country and around the world have responded very favorably as a result. With some of our recent high-profile wins, we are positioned to gain more traction with large agencies from both State and Federal levels. SecurityStockWatch.com: We also learned through recent announcement about some key wins with Military accounts. Can you tell us more about these? Dave Owen: ICOP mobile video systems have been deployed to 11 Air Force Bases in the Southern US, stretching from Arizona to Florida. The units will be installed in vehicles operated by the Air Force Security Forces at their respective bases. The initial order was valued at over $200,000, with up to $1.4M in total fleet deployment. The sale originated at Randolph Air Force base, a long standing ICOP customer for both police and fire vehicles. SecurityStockWatch.com: May we have an overview of ICOP’s key strategic partnerships and how they are progressing? Dave Owen: The strength of our partnerships is just one of the strategies we have worked to carefully build over time. In fact, we recently secured an initial order from Langley Air Force Base in Virginia through one of our key strategic channel partners, again, for use by the Air Force Security Forces. We also won a large agency located right here in our own backyard, Olathe Police Department through that same relationship, in head to head competition with one of our largest competitors. In addition, we have a co-marketing agreement with Sprint and participate in many tradeshows with them to show the compatibility of our ICOP Live streaming product and its efficiency using the Sprint 4G network. SecurityStockWatch.com: Let's turn to the international market for a moment. What's the latest on your penetration in the Saudi Arabia market? 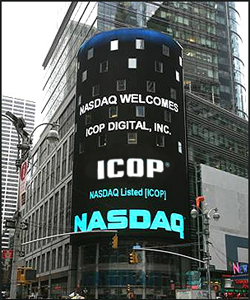 Any other international markets heating up for ICOP? Dave Owen: We are currently the only in-car video company who has sold its products to the Ministry of Interior (MOI) in that country through our distributor, DDIT. There are several additional tenders from the MOI that we expect to see in the coming months. We are gaining traction in the South America market as well. SecurityStockWatch.com: In today's challenging economy, it is no small feat that your domestic sales increased 16.3% over the same six (6) month period in 2009 and that 54% of the units sold during the second quarter were to new ICOP customers. How does the balance of 2010 look and what are the prospects for 2011 top line and bottom line? Dave Owen: We are very encouraged with the sales pipeline we are seeing at this time. We have built a very solid domestic base with our product and with the international markets opening for us we believe we are on a very sustainable growth pattern as we approach the 4th quarter of 2010 and into 2011. SecurityStockWatch.com: Thanks again for joining us today, Dave. Are there any other subjects you'd like to discuss? Dave Owen: The security industry is a very fast growing sector of our economy due to the uncertain world we live in. We have worked diligently to stay ahead of the curve with several new product developments that our team recently showcased at the International Association of Chiefs of Police (IACP) Conference held in October in Orlando, Florida. Some of these developments include a new .0004 lux camera that provides a near infrared (IR) video image, our new wireless upload capabilities of recorded video files, providing industry leading speeds and throughput and the addition of Solid State Hard Drives, that can store up to 128 GB of video and audio data. We feel we have a mission to provide first responders, with the very best equipment possible. Our team is constantly thinking about what we can do to better our products in light of the critical situations in which they are depended by our customers.